Elliott Eliason (left) is averaging 2.5 blocks and 8.4 rebounds per game, while Mo Walker is averaging 6.0 points and 4.6 rebounds for the Gophers this season. MINNEAPOLIS — As Gophers centers Elliott Eliason and Mo Walker battle for playing time in Minnesota’s frontcourt, the duo constantly is trying to one-up the other during practice and push each other to be better. That goes for their facial hair, too. "Mo grew a beard out, so I had to grow my beard out to beat him," Eliason joked Thursday. "We try and challenge each other every time on the court." The result of that friendly competition has resulted in the progression of Minnesota’s two centers, both of whom have made big strides on the court from a year ago. Walker dropped 60 pounds this past offseason in order to play in new coach Richard Pitino’s up-tempo system, and Eliason has honed his craft, as well, and has become a shot-blocking presence in the paint. Pitino said he challenged the two players earlier this week in practice to continue to push each other. When Walker had a strong individual workout, Pitino questioned how Eliason would respond. "I got after Elliott saying, âElliott, Mo is going to beat you out,’ and Elliott came right back and had a phenomenal practice," Pitino said. "So it just showed those two guys are making each other better." 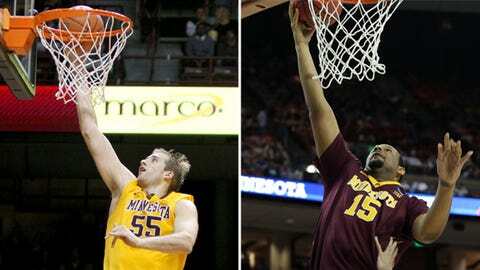 Coming into the season, Minnesota’s frontcourt was expected to be a weakness. The Gophers have plenty of talented guards — including Austin Hollins and Andre Hollins — and Pitino’s style of offense places importance on the guards. But the big men were relatively untested. It didn’t help that Minnesota lost forward Trevor Mbakwe to graduation and needed to replace his production down low. Yet the frontcourt hasn’t been an issue through the Gophers’ first 11 games. Eliason is averaging 2.5 blocks and a team-high 8.4 rebounds per game, while Walker has chipped in 6.0 points and 4.6 rebounds — mostly off the bench — in the five games he’s played since a six-game suspension to start the year. Things could certainly change for Minnesota’s frontcourt when the Gophers get to the Big Ten portion of the season, where they’ll face bigger and more physical post players. For now, though, both Walker and Eliason are happy with their progress. "It’s a real challenge because there are so many other big guys in the Big Ten," Eliason said. "I don’t think we’ve seen that outside of Syracuse. â¦ I think it’s a challenge we definitely think we’re up for, and we’re ready for it." Each of Minnesota’s two centers possesses attributes the other doesn’t. Walker admits that Eliason is a better rebounder and shot blocker, while Eliason compliments Walker’s ability to defend the pick-and-roll. As they both work on individual parts of their game, they study what their practice partner does and take notes. "I try to learn off of Elliott," Walker said. "Just my defensive game, I try to be better in the sense that he is." Before Wednesday’s practice, Pitino wrote the statistics of Florida senior Casey Prather on the whiteboard as an example for his team. Pitino served as an assistant coach at Florida and was there when Prather barely saw the court — he averaged just 6.7 minutes per game as a freshman and 9.5 minutes as a sophomore. Now as a senior, Prather is playing 30 minutes a game and is scoring 18.7 points per night. That’s the type of progression he hopes to see from Walker and Eliason, both of whom are seeing career highs in minutes and are making the most of their time on the court. It’s not always a quick process to get to that point, though, as Pitino illustrated. "The year I was there, (Prather) hardly played and he had a long way to go. But he went against Chandler Parsons every single day, and Chandler made him better," Pitino said. "Now he’s benefiting from that — not as quickly as some people would have liked, but he’s very good four years down the road. If Mo and Elliott can continue to do that, it’s not going to happen overnight, but I think they could be very good." That competitive spirit between Walker and Eliason extends beyond practice. When an ankle injury limited Eliason to just four minutes in Minnesota’s game against New Orleans earlier this month, Walker stepped up in his absence. Walker played a season-high 23 minutes and had perhaps the best game of his career as he scored 11 points and grabbed eight rebounds. Both centers have taken different paths to get to this point in their junior years: Walker missed time with a knee injury and dropped a lot of weight, while Eliason has stayed the course and continued to get better. Regardless of how they’ve gotten here, it’s clear that Eliason and Walker have done so with the help of each other. "We definitely believe in the process," Walker said. "We definitely believe in getting better year by year and sticking to the plan." Added Eliason: "I can’t say it any better than that."